The scholarship of teaching and learning (SoTL, pronounced “sō-tul” in the US) is a synthesis of teaching, learning, and research in higher education that aims to bring a scholarly lens—the curiosity, the inquiry, the rigor, the disciplinary variety—to what happens in the classroom (brick-and-mortar, virtual, co-curricular, et al.). aiming to improve student learning by strengthening the practice of teaching (one’s own and others’). We say that SoTL brings a scholarly approach because it begins with intellectual curiosity, is conducted deliberately and systematically, is grounded in an analysis of some evidence, and results in findings shared with peers to be reviewed and to expand a knowledge base. 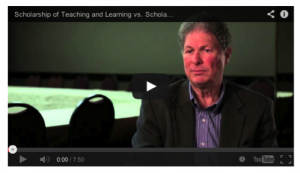 The videos below distinguish between SoTL and scholarly teaching and then outline some of the key characteristics of SoTL.